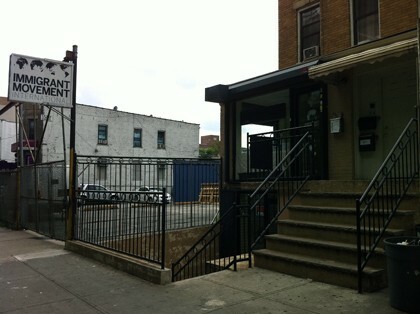 Headquarters of the Immigrant Movement International in Corona, Queens in New York, which I visited yesterday afternoon. Events take place daily. Consult the website for more details and a calendar of programs: http://immigrant-movement.us. In the last decade, the protagonist role that the artist’s body had in her earlier work, disappeared almost entirely. In her placement, Tania Bruguera has engaged actors, and more usually invited the general public to perform. In one of a series of artworks titled “Tatlin’s Whisper,” Bruguera hired two policemen on horseback with expertise in controlling riots to choreograph the course of the museum’s audience. That performance was presented in 2008 at the Tate Modern’s Turbine Hall, as part of the two-day exhibition The Living Currency [La Monnaie Vivante] curated by Pierre Bal Blanc. In another work in the series “Tatlin’s Whisper,” the public could use the microphone to exercise a minute of free-speech. This latter work was staged in 2009 at the Centro Wilfredo Lam in Havana. I should add: authorities were not exactly pleased.